HomeMini statementHow to Get Bank of Baroda Account Mini statement by missed call and SMS? 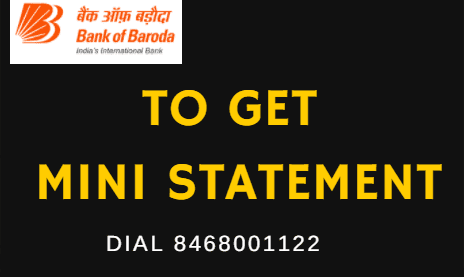 How to Get Bank of Baroda Account Mini statement by missed call and SMS? If you haven't yet updated your passbook, but you badly need info about your recent transactions, then the mini statement is the best option! As per current situations, people don't have time to stand in a queue and get their tasks done. It is likely; you may have to stand in a queue at the ATM and get the mini statement. Banks have embraced digital banking, to provide convenient and hassle-free services. With the digital banking services, banks can deliver customer-centric services. You can simply give a missed call or send an SMS from your registered mobile number to get the mini statement. Every bank has its toll free number. Bank of Baroda has generated its toll-free number! By sending SMS or giving a missed call to this toll-free number you can get the mini statement. Here is the process to get Bank of Baroda mini statement by missed calls or SMS. If you wish to get the mini statement from Bank of Baroda, dial 8468001122. Your call will get disconnected after a ring by the system, and it will validate whether the call is a registered number or not. You will receive an SMS from the system in response to your call. For Only Balance Enquiry check: How to check Bank of Baroda account Balance by Missed Call? Important note: If in case, you have registered same mobile number with multiple accounts, the system verifies which account registry details with the mobile number. How to Register mobile number for Mini statement Facility? If you haven't registered any account number, you will receive an SMS requesting to register the preferred account with the number for availing the specific services. You can register the preferred account number by sending an SMS. Type 'REG <Last four digit of account number>' and send it to 9176612303 (Normal charges is applicable) or 5616150 (Premium charges is applicable). You can easily change the preferred account number anytime. You need to send SMS to register another account number as the preferred account number. If you have registered the same mobile number for multiple accounts and have not configured the preferred account, you can only avail the balance inquiry service and not get the mini statement. If you have given a missed call from your mobile number not registered and associated with an account, you will receive no SMS. Bank of Baroda offers this service round the clock. Any customer can request the mini statement once in a day. If you comply with the terms of the bank, you need not pay any charges for requesting a mini statement as your call will get disconnected after the first ring. You will receive the mini statement via SMS. If you have registered the same mobile number with multiple accounts, you need to make one of the accounts primary account for accessing the mobile services. SMS charges are applicable under such circumstances! Don't wait in long queue for a long time to get the mini statement. Simply give a missed call and send an SMS to get the mini statement! Get your account transaction information by simple steps! bank of Baroda mini statement enquiry number by a missed call. I WANT TO CHANGE MY MOBILE number IN MY ACCOUNT FOR FACILITY ON MINI STATEMENT.